This Black and White skirt and matching leg warmers were created using a thermal type shirt in a 60% Cotton blend. 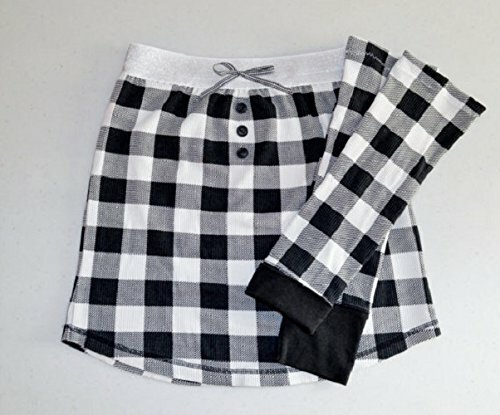 There is a sparkly wide elastic waist, and I added a bow in tiny black and white checks and buttons for style. Soft and warm, it can be dressed up, or worn with leggings... very versatile. You can help our planet while looking fashionable and trendy! The waist, UNstretched is 25" (63.5 cm) and stretches to about 29". The hem line is slightly curved and measures 16.5" (42 cm) at front and back, and 15" at the sides. I would say a size 6+/-, but please go by your own measurements for a proper fit. There is a decent amount of stretch. All materials are pre-washed in my homemade laundry soap, and rinsed in our mountain well water with white vinegar for softness and purity. Created in a smoke-free home. If you have any questions about this product by Pearl's Homespun, contact us by completing and submitting the form below. If you are looking for a specif part number, please include it with your message.